hi. nice work there.but will it be better if the map of the world of final fantasy anniversary ii is done out? i have some problem locating myself and finding new places on the map. therefore i feel that a complete world map done out with names of the places included will be a great help. Thanks for all your hard work. There’s so many maps though that I can’t imagine you’d be able to get them all posted. I don’t even know what it takes to get one map made. Perhaps if I knew how, I could somehow help out and contribute? 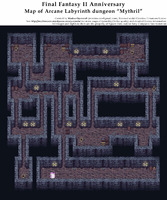 I could sure use maps of other dungeons showing where things are. 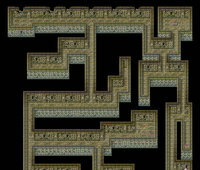 I’m stuck in the pandeomonium dungeon right now and a map would sure help out A LOT. After I’m done with FFII, I’ll be starting on FFI (PSP). It would be nice if there were maps for that one as well. What takes a lot of work is to make them like this, using screenshots. It could be done much faster by just drawing the map by hand and/or in some drawing program, but then it wouldn’t look so good. 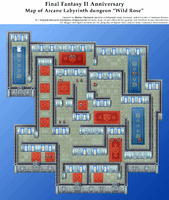 All other maps you can find on http://vgmaps.com , since most of the game (except for the Arcane Labyrinth) is just a remake of the NES originals.